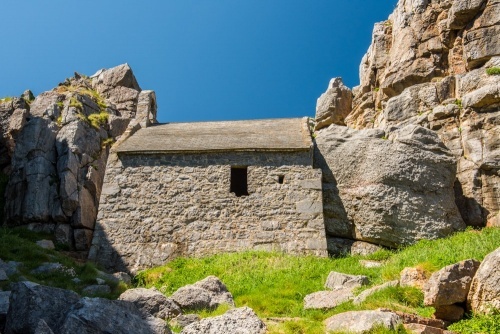 St. Govan's Chapel is a small medieval church clinging to the ragged rock halfway down the cliffs of a secluded headland. It is difficult to imagine a more strikingly situated church in all of Britain. 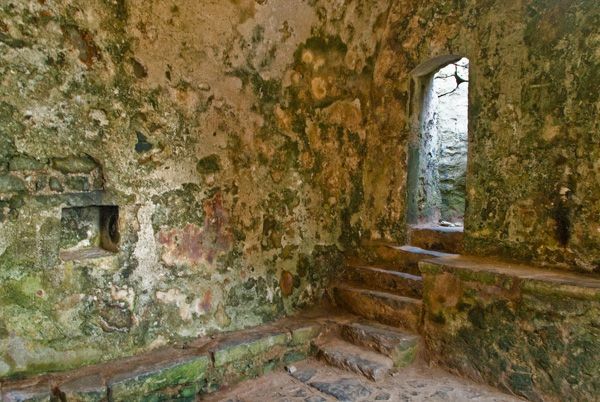 St. Govan was a sixth century hermit who established a cell for himself on this lonely spot, in the fashion of early Celtic Christian monks, who tended to live in isolated places. 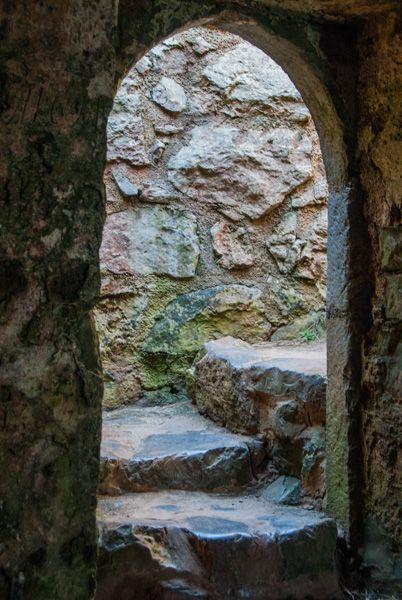 Legends sprang up about the saint, and about the curative properties of the natural spring that used to rise just inside the door of the chapel. 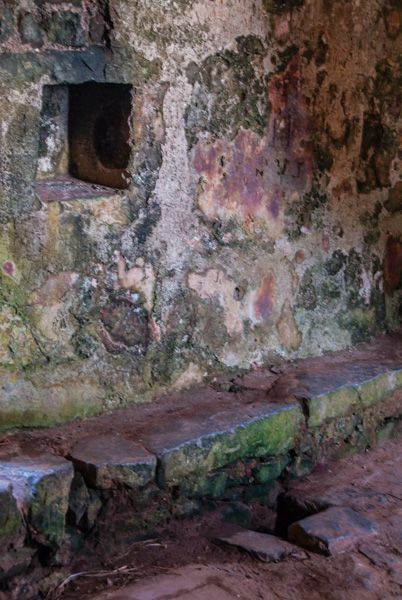 During the medieval period the holy well and cell became a place of pilgrimage for cripples seeking a cure, and the original cell was rebuilt as a small chapel in the 13th century. The chapel is a very simple rectangular building with a steeply pitched roof and bellcote. Much of what we know about Govan is a tangled web of myth and half-truths, but it appears that he was born in Ireland, a member of the Hy Cinnselach tribe of County Wexford, and his real name was Gobban, or Gobhan, meaning smith. From this we can deduce that Govan's father may have been a smith or metalworker. While still a boy Govan joined a monastery founded by St Ailbe at Dairinis, near Wexford. Govan journied to Rome and later stayed at St Senen's monastery in Inniscathy. When Ailbe died, Govan returned to Dairinis and became Abbot. Ailbe had been a native of Solva, just along the Pembrokeshire coast from the chapel, and this fact may have influenced Govan to visit the area, or perhaps he was visiting a Welsh abbot. We simply don't know what brought Govan, by now an elderly man, to Pembrokeshire. 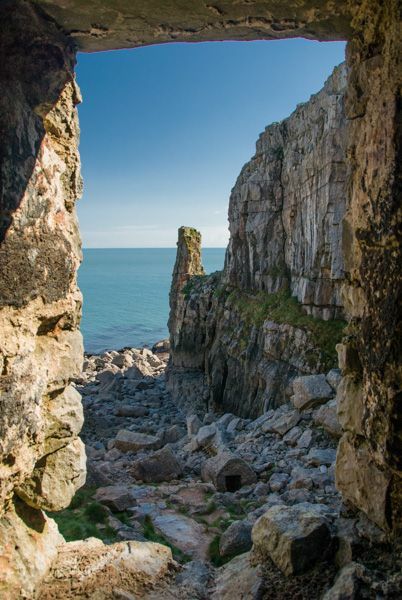 The stories tell that pirates from Lundy tried to capture the monk, who sought shelter in a crevice, or fissure, in the cliffs. The fissure opened up to receive him, then closed to hide him from the pirates. Once they had departed the crevice opened once again to release him. Now we are left to speculate; why did Govan stay and build a small cell by the fissure? Once version says that he was ashamed of his cowardice, another that he thought to convert the pirates, another that he thought his presence could help the local population, who were constantly troubled by the pirates. Whatever the reason, the elderly monk built a rudimentary stone cell and there he stayed for the rest of his life, preaching to the locals and traveling around south Pembrokeshire to spread the Celtic Christian gospel. Govan died in 586 and is said to have been buried under the stone altar in the chapel. A crevice in the chapel has rib-shaped impressions on the sides, said to mark where Govan hid from the pirates. An ancient legend says that if you make a wish, enter the fissure, and are able to turn your body around within it, the wish will be granted. Presumably, the, it is easier for very thin people to get what they wish for! A further legend states that King Arthur's knight Sir Gawain lies buried beneath the stone altar of the chapel. Outside the chapel is a large rock called The Bell Rock. The name recalls another story; that Govan was given a silver bell, which was stolen by pirates. When Govan prayed for its return, angels retrieved the bell and placed it inside the rock for safety. When Govan tapped the Bell Rock the bell sounded, one thousand times louder than the original bell. There used to be a well inside the chapel door, but this has dried up. The small arched wellhead below the chapel covers the site of another well, also dry. This was said to be both a holy well and a wishing well. 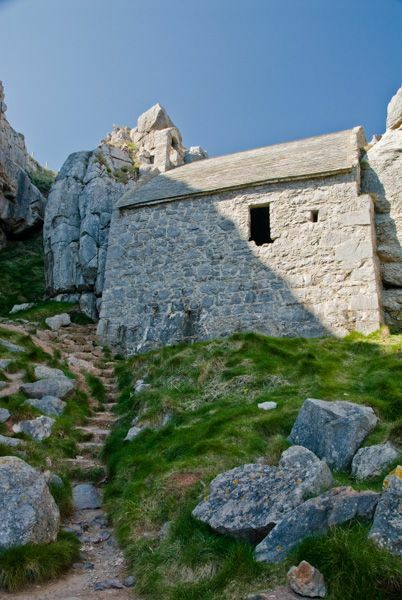 St. Govan's Chapel is contained within the Pembrokeshire National Park, and the Pembrokeshire Coast National Trail runs along the nearby cliffs. The area is far enough off the beaten track that even today it retains an air of secluded beauty. 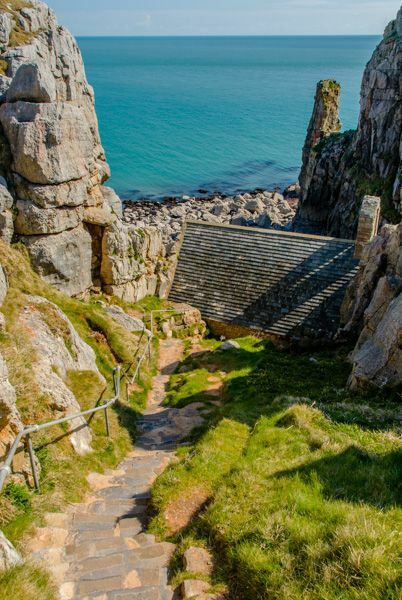 Access is by way of 52 stone steps from the top of the cliffs. The chapel is contained within a military firing range and can only be accessed when the firing range is open to the public. For your own safety, please observe posted warnings! This truly is a special place; an air of ancient mystery clings to the chapel and there is just 'something' in the air. The location is utterly splendid and is well worth a long detour to visit!